The Iris Slim Project Case fits papers 8.5" x 11" in size. 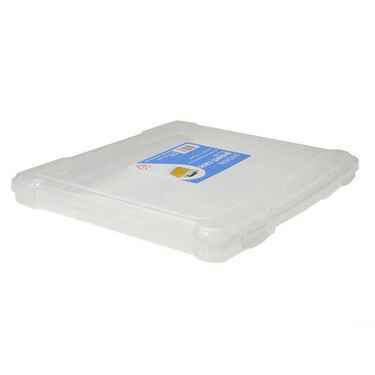 The wholesale plastic project cases allow you to stock up on these containers and save. Use it to store files, documents, folders, or craft supplies. This craft storage box can slide away when not in use and the easy-to-carry handle makes it portable for anywhere you want to work on your project. These scrapbook storage boxes are a part of a larger line of Iris scrapbook storage items. Each of the Iris scrapbook storage containers differ in size slightly so you can find the right boxes for the job. The Iris slim project case doesn't just have to be used as scrapbook storage boxes - use them for arts and crafts storage to hold crayons, coloring books, markers, or even toys. The Iris slim project case comes in a set of 10 so you can get all your scrapbook storage containers at once and start getting your whole space organized.